Gang truce charges dismissed, what's next? The judge overseeing the trial of government officials involved in the 2012 gang truce in El Salvador has dismissed the charges against all the defendants. 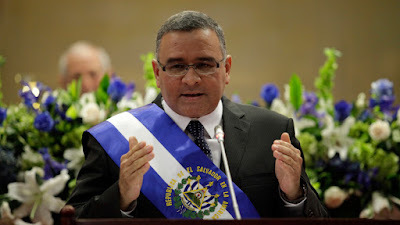 The judge ruled that the prosecutors had failed to prove their case, and pointed primarily at the Minister of Justice and Public Security, David Munguía Payés, who is now the Minister of Defense in El Salvador. 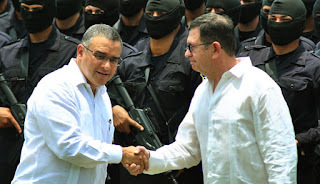 Munguía Payés initiated and authorized the government's participation in the truce, according to the court, and the judge also pointed at the likely involvement of then president Mauricio Funes. The defendants in the case were simply implementing a plan created at the top levels of the administration of president Funes. El Salvador's Attorney General announced on Thursday that he will appeal the dismissal of the charges. El Salvador's Minister of Justice and Public Security, Mauricio Ramírez Landaverde, released a video on August 18, showing conditions in solitary confinement cells where prisoners who have attacked the police or armed forces will be held. The conditions are justified as part of the "exceptional measures" which the National Assembly has authorized to combat the epidemic of gang violence in the country. As he narrates the video, Landaverde describes the cells where prisoners will be held in absolute isolation with no contact with the outside world. There is no artificial lighting or ventilation in the cells. There is only a small window about one foot square above the toilet covered by bars. Beds are concrete slabs. For a number of years, a court in Spain has had before it a case involving the 1989 murder of the Jesuit priests at the University of Central America. Although the case is before the court, none of the former military officer defendants are yet before the court. 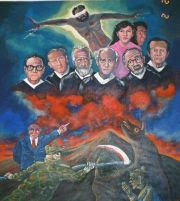 El Salvador's Supreme Judicial Court has twice denied extradition of the officers who are in El Salvador. August 15 is the 100th anniversary of the birth of slain Salvadoran archbishop Oscar Romero. 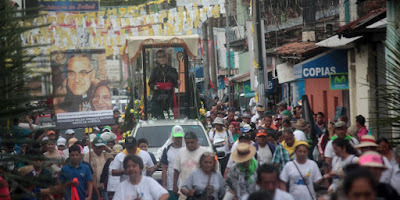 Romero was beatified by the Roman Catholic church in 2015, and the country's faithful continue to wait expectantly for news that the church will canonize Romero and officially give him the title of saint. Last week researchers from the Public Opinion Institute at the University of Central America (IUDOP) and Florida International University released the results of polling concerning the perceptions of the Salvadoran public concerning the police. The report is titled Legitimacy and Public Confidence in the Police in El Salvador. The report surveyed persons throughout El Salvador about their interactions with police and their views of police practices. Although many persons, especially the youth, have been subjected to abuse by police, there is still significant tolerance for such practices. While 60% of Salvadoran believe that the police should follow the law in combating crime, 40.1% would approve the use of torture in dealing with gang leaders, 34.6% would approve extrajudicial executions and 17.2% are okay with practices of "social cleansing."